Reduce energy and chemical costs by stabilizing your water treatment process. ControlSoft improves water treatment processes by eliminating excursions and stabilizing control. More predictive control results in lower energy requirements, reduced chemical costs, longer equipment life while reducing maintenance costs. Our advanced technology solutions are applied in all water treatment processes: wastewater, drinking water and industrial process water. Take the first step today and call us to evaluate your water treatment control problem. We have a team of dedicated project and support engineers with over 30 years experience in the water wastewater industry who provide a full range of project services, delivering the best process control solutions for your operations. They help you rein in energy use and manage your assets to deliver process efficiencies that counter rising ancillary costs. Our scalable process control solutions are ideal for water and wastewater treatment. See how we’ve helped companies improve their water quality and energy usage. Our water treatment control experts can help you deliver consistent water quality at reduced operation and maintenance costs with control strategies designed specifically for your application. Implement advanced control of chemical injection systems, such chlorine, de-chlorination, pH, hydrofluorosilicic acid (HFS) and coagulants (alum and organic polymers). Optimize control of oxygen flow through aeration basins to conserve oxygen and the related energy. Eliminate pH variations in water networks to reduce corrosion and lead leeching. Stabilize the operation of membrane bioreactors to maximize treatment efficiency. 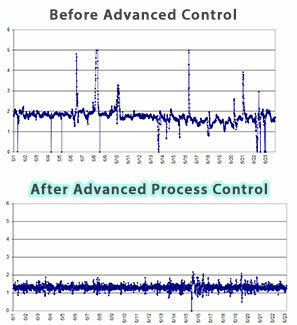 Apply advanced control strategies to steady pH and ORP processes consistently. Deliver more consistent and predictive operations.